I began my week high above Edinburgh, on a beautiful summer morning at the top of Arthur's Seat. The bracing climb certainly blew away the cobwebs, well OK, the overindulgence of the Edinburgh Television Festival where I had been spending the weekend. There, as in the world of politics, the issue of trust had been dominating the agenda. In his MacTaggart lecture Jeremy Paxman agreed with Tony Blair and Alastair Campbell's assertion that an overcompetitive media has led to a distortion of news stories, "a clamour for noise". Whether it's the fault of the media or the succession of spin and sleaze stories under Labour, there has been an erosion of trust in politics. That is an issue which has greatly concerned Gordon Brown hence his stress on change, an attempt to draw a line under the Blair years. Certainly many of his supporters were convinced that he would be very different from his predecessor, an image he did nothing to dispel. It was once described to me as "Gordon flashing his red petticoat". I think the colour may have run in the wash. 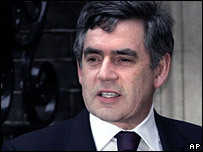 This week Mr Brown dashed the wishful thinking of many Labour MPs, party members and trade unionists. On Tuesday came his reply to a letter about Iraq from the Liberal Democrat leader Sir Menzies Campbell. The prime minister rejected the call for a timetable for British troop withdrawal and repeated that the government policy is for a "conditions-based withdrawal". As we charted on the programme, ministers had initially been optimistic that troops would hand over Basra province (the last of the four under British control) to Iraqi control in the spring. That slipped to the summer, then "before the end of the year". On the Today programme, David Miliband wouldn't be drawn on a date at all. So does that mean that conditions on the ground have worsened? Or has there been American pressure to keep British troops on the ground? No doubt this debate will continue in the run up to the Petraeus assessment of the US troop surge in September. For the trade unionists who supported Mr Brown's leadership campaign, there was another disappointment this week with his stance on public sector pay. 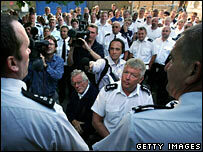 Prison officers took strike action on Wednesday against the staging of their pay which reduced its value from 2.5% to 1.9%. The prime minister said that he was determined that public sector workers should stick to a 2% limit. Martin Weale, from the National Institute of Economic and Social Research, explained to us that Mr Brown had initially been too strict with pay, then too lenient which has led to spending problems, hence the need for restraint now. This is a difficult balancing act for the Labour leader. A few headlines about standing up to the unions may help his standing more generally but strikes and disruption would surely tarnish his honeymoon. A disgruntled party may not want to pull out all the stops in an election campaign. Send your comments using the form below.